Our engineering team works with United States military and military contractors to ensure they’re able to find a solution that fits in seamlessly with their applications and processes. Quiet tactical generators, water purification and tank haulers, pumps and flight line air conditioners all need a power solution that’s as tough as the work they do. Luckily, if it works hard and needs an engineered power solution that can keep up, CK Power can supply it. But it’s about more than simply supplying a workable power solution. CK Power can provide diesel and jet fueled solutions to meet your needs. 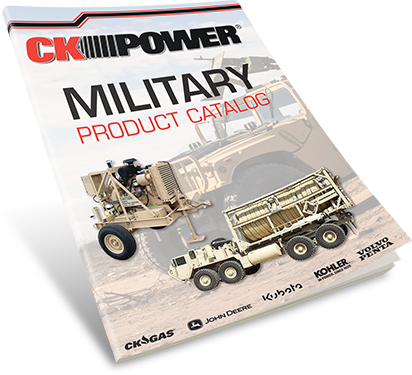 With over 20,000 units in the field CK Power has the military application experience. We don’t just manufacture power solutions that satisfy the new regulations. We engineer solutions that work with your current OEM operations, because accommodating a new gen set shouldn’t mean starting from scratch. Power solutions custom engineered to fit your needs. If you need a power generation solution that’s custom-tailored to your application needs CK Power has an engineering team with the know-how to design the right solution for your application. Get in touch with us to talk to a CK Power representative about the right solution for you.